The vet tells me she’ll probably lose all her teeth, but I’m told this sounds a lot worse than it is and that many such cats happily eat even hard food. I don’t think she uses her teeth on Kaiju, either; when he makes himself obnoxious she slaps him. I’m sorry for your cat health trauma! 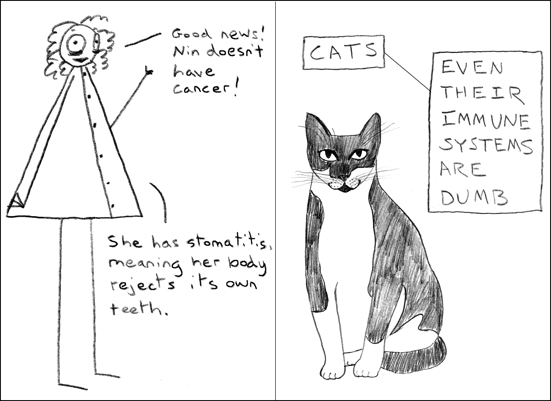 I have a cat who has been living more or less happily with stomatitis for years now, if that helps. She did have most of her teeth removed because they were very icky, but she does, indeed, eat some hard food. Best wishes to you and Nin; I bet she’ll be fine as a limited-teeth creature! As the vet pointed out, cat teeth aren’t for chewing, they’re for ripping and tearing, which a cat living in a Manhattan one-bedroom doesn’t have to do very much. Still, I admit the thought of her losing her fangs disturbs me a bit, purely for cosmetic reasons.